The second AFLW semi-final sees the Adelaide Crows and Geelong Cats fight for a spot in the decider. The game will begin at 1pm (AEDT) on Sunday, March 24, and will be played at the Adelaide Oval. This is The Roar’s ultimate guide to the second AFLW semi-final, with key information, squads and a broadcast guide. 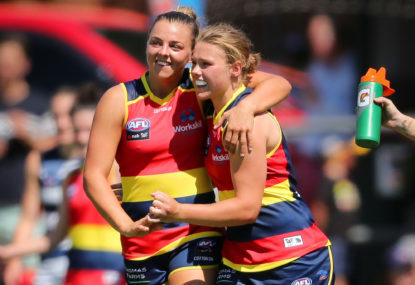 Adelaide finished 2019’s home-and-away season as by far the most dominant team, racking six wins against one loss and boasting a whopping percentage of 212.9. Geelong, on the other hand, have the controversial conference system to thank for their finals appearance, with their uninspiring record of 3-4 allowing them to qualify ahead of teams with better records, such as North Melbourne and Melbourne. The Crows ran out comfortable 29-point victors when the teams clashed in Round 3. Several options are available to those who want to watch the match on television. Fox Footy (504) has adbreak-free coverage from 1pm (AEDT), although you’ll need a valid Foxtel TV subscription to access their broadcast. Free-to-air television are available as well, however. Channel Seven will have a live broadcast of the match on their main channel in Melbourne, Adelaide and Perth, while Sydney and Brisbane viewers will instead need to tune in to 7mate. If you’re in another area, check your local guide for listings. The easiest way to stream the game would be via Kayo Sports, a streaming service that lets you catch most of Foxtel’s sports content for $25 per month. You are also able stream the game through Foxtel’s streaming services, either the Foxtel App or Foxtel Now. The Foxtel App is included in a Foxtel TV subscription, whereas Foxtel Now is a streaming-only variant of the pay-TV service you can subscribe to on its own. Other options include Seven’s streaming app, Plus7, or the official AFLW app.